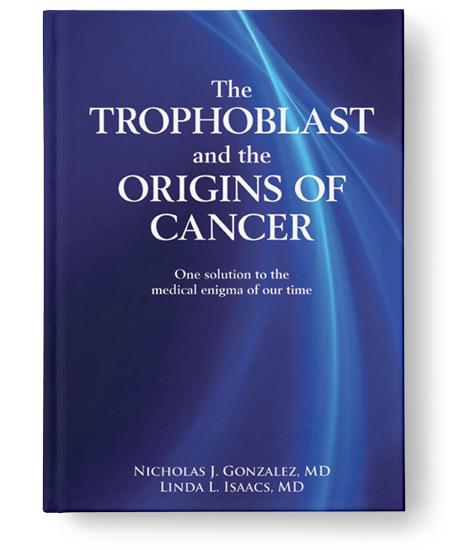 In this book, Dr. Gonzalez and Dr. Isaacs provide a comprehensive review of Dr. John Beard’s 100-year-old theories about cancer, from the perspective of contemporary molecular biology. The authors show how Dr. Beard most likely discovered stem cells, and very well may have uncovered the root origins of cancer – and its effective treatment with proteolytic enzymes. The book includes extensive case histories of cancer patients successfully treated with the Gonzalez nutritional-enzyme regimen. The Table of Contents, an excerpt from the Introduction, and Reviews are available on the New Spring Press site. A longer section from the book was published in the journal The Original Internist as an article, The Evolution of Enzyme Treatment. “Dr. Gonzalez and Dr. Isaacs have done an outstanding job presenting this material. It’s a compelling biochemical drama with powerful insights and is wonderfully written. The stem cell connections are thrilling.” Stephen Levine, Ph.D. reviewing the book on Amazon.